Keywords: Farm Yard Manure, Soil organic matter, Earthworm population. 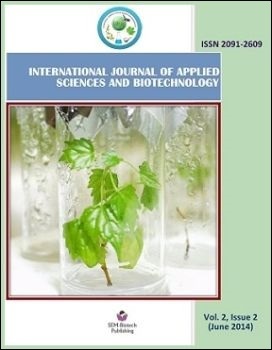 Two experiments were carried out in a Randomized Complete Block Design with six treatments (0, 10, 20, 30, 40, 50 Mg FYM ha-1) replicated four times at the horticultural farm, IAAS, Rampur, Chitwan, Nepal in winter (Oct-Jan) and spring (Feb-May) seasons to quantify optimum dose of organic manure (FYM) to maintain earthworm population and enhance soil properties. In each treatment 100 earthworms (Eisenia fetida) were inoculated within one square meter of each plot. Porosity in the first season was significantly higher than the control treatment (0 Mg FYM ha-1). In the second season it remained unaffected but in increasing trend. In the second season the highest porosity (40.75 ± 1.57%) was obtained from 50 Mg FYM ha-1. The highest bulk density (1.553 ± 0.017 Mg m-3) in the second season was observed from the control treatment but it was in decreasing trend with increasing doses of FYM. There was no significant effect of FYM on pH in the either season. The highest OM (3.87 ± 0.22%) was observed from 50 Mg FYM ha-1 which was similar to 30 and 40 Mg FYM ha-1 in first season. Similarly, in the second season, increasing doses of FYM increased the OM and the highest OM (3.83 ± 0.19%) was from 50 Mg FYM ha-1 which did not differ from 40 Mg FYM ha-1. As anticipated, the lowest OM 2.425 ± 0.224% and 2.275 ± 0.1968% were from control treatments of the first and second seasons, respectively. As the doses of FYM were increased, earthworm populations were also increased significantly in the both seasons. Earthworm numbers from 50 Mg FYM ha-1 were significantly higher than the 20, 30 and 40 Mg FYM ha-1 in both seasons. The highest numbers 887 ± 12.84 and 976 ± 20.30 of earthworm per square meter were recorded from 50 Mg FYM ha-1 in the both seasons, respectively. Thus, the application of 30 Mg FYM ha-1 is optimum for both the seasons to improve soil properties and to maintain earthworm population in the agricultural field. Also, this research indicated a possibility for earthworm inoculation in the field to enhance soil fertility for sustainable agriculture in the western Chitwan, Nepal.